The Nation: We'll Save The Earth On Our Terms Commentator Naomi Klein didn't have a voice when she sat in Secretary of State Hillary Clinton's Thursday press conference. But from what was discussed, even if she had a voice, she'd have been speechless: the United States wants all or nothing. 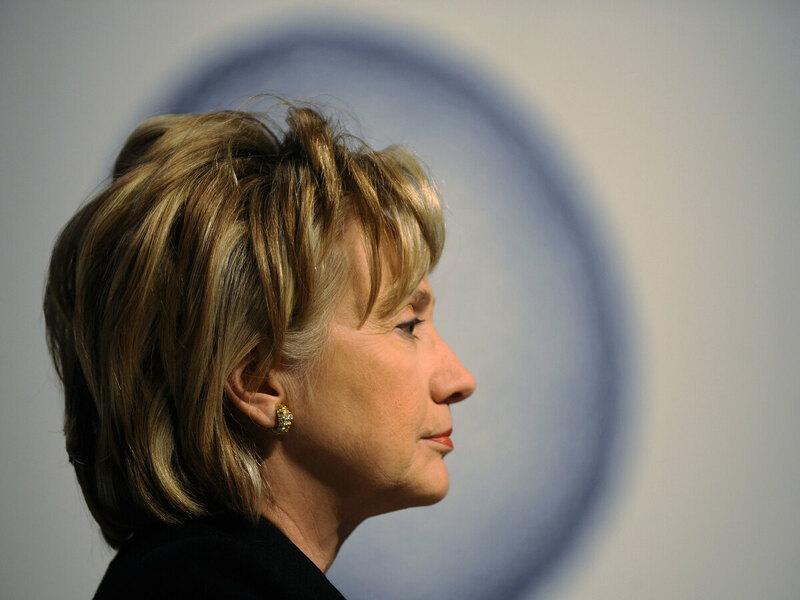 U.S. Secretary of State Hillary Rodham Clinton speaks during a press conference at the Bella Center in Copenhagen on December 17, 2009. Yesterday was the second to last day of the climate conference and I had the worst case of laryngitis of my life. I opened my mouth and nothing came out. It's frustrating because I was just at Hillary Clinton's press conference and desperately wanted to ask her a question — or six. She said that the U.S. would contribute its "share" to a $100-billion financing package for developing countries by 2020, but only if all countries agreed to the terms of the climate deal that the U.S. has slammed on the table here, which include killing Kyoto, replacing legally binding measures with the fuzzy concept of "transparency," and nixing universal emissions targets in favor of vague "national plans" that are mashed together. Oh, and abandoning the whole concept (which the U.S. agreed to by singing the UN climate convention) that the rich countries that created the climate crisis have to take the lead in solving it. It was naked blackmail — forcing developing countries to choose between a strong fair deal that stands a chance of averting climate chaos and the funds they need to cope with the droughts and floods that have already arrived. I wanted to ask Clinton: Is this not climate structural adjustment, on a global scale? We'll give you cash, but only with our draconian conditions? And who is the U.S. to call the shots when it carries the heaviest responsibility for emitting the gasses that are already wreaking havoc on the climates of the global south — what happened to the principle that the polluter pays? But...no point raising my hand, no voice. Bolivia's Ambassador to the United Nations, Pablo Solon put it best: "It seems negotiators are living in the Matrix, while the real negotiation is taking place in the 'Green room,' in small stealth dinners with selective guests."